Hike the Sitton’s Gulch Trail from Cloudland Canyon’s towering rim to the canyon floor, exploring waterfalls, towering hemlock trees, massive boulder fields, and abundant springtime wildflowers. 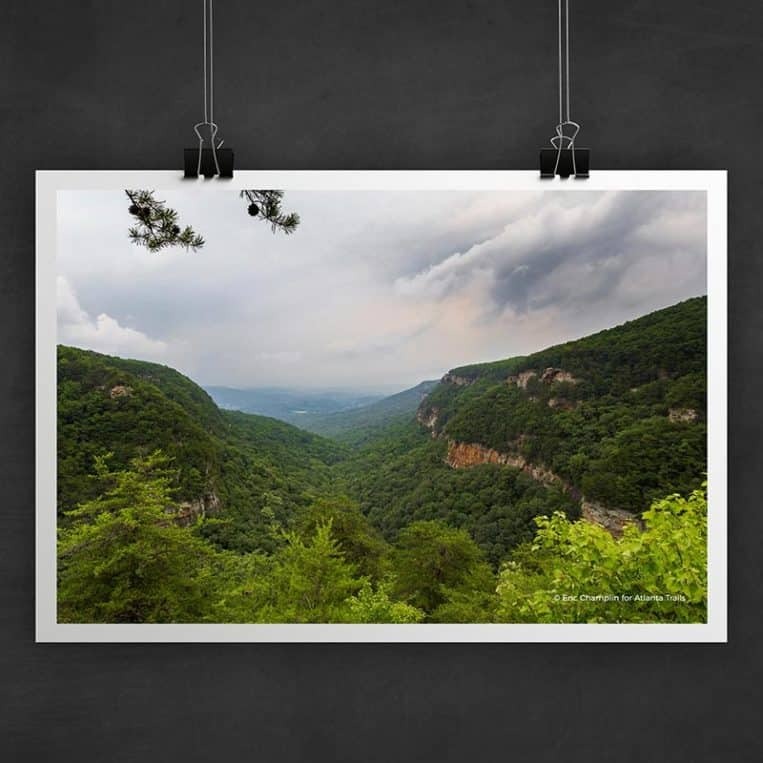 Cloudland Canyon is one of Georgia’s most scenic and beautiful state parks and an outdoor paradise for hiking and camping. With towering, near-vertical canyon walls, lush forest, plunging waterfalls, towering trees and a rocky landscape, it’s easily one of our favorite hiking destinations in our state. The Sitton’s Gulch Trail explores some of the park’s most beautiful and serene areas. The trail dives down from the canyon’s lofty, view-filled east rim to two enormous waterfalls, and then descends into the remote, boulder-filled canyon floor, exploring a series of smaller, tumbling waterfalls nestled deep within the canyon’s depths. 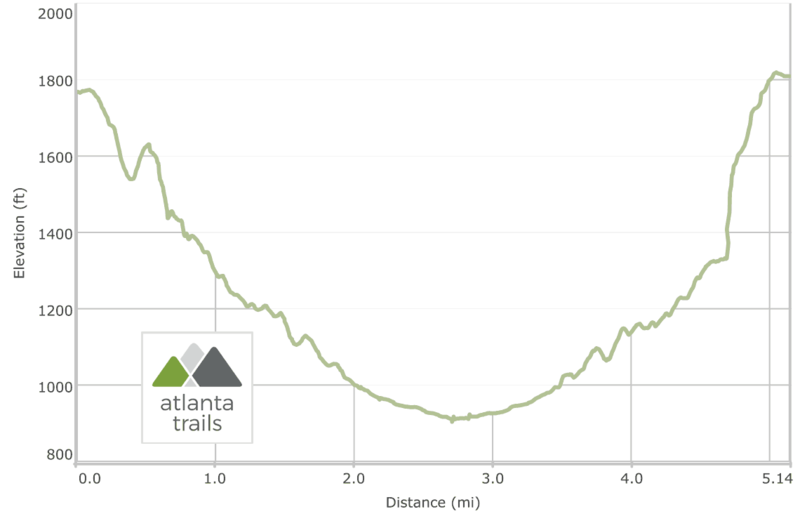 This is not an easy hike, thanks to an exceptionally steep return to the trailhead. But the natural beauty on this hike abundant, and it’s easily our favorite trail at the park. The hike’s outbound route is fairly easy, with an almost continual descent. It’s the 3-mile return that’s the challenge, requiring a 900-feet-climb of stairs to the canyon’s rim. It’s a great workout, though, and with multiple waterfalls, outstanding views and a whole lot of beautiful forest to explore, we think it’s totally worth the effort. The trail shares the initial plunge into Cloudland Canyon with the Waterfall Trail, departing the east rim trailhead and catching incredible, expansive views (view maps and driving directions). 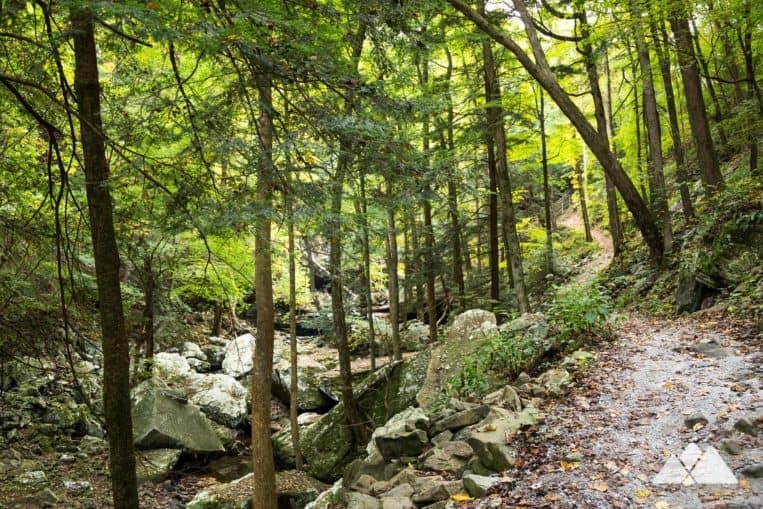 The trail quickly splits from the yellow-blazed West Loop Trail, turning right to descend toward Hemlock and Cherokee Falls. The trail drops elevation along chiseled, steeply-pitched canyon walls, descending on stairs, wooden boardwalks, and dirt as it plunges to the canyon floor. The trail reaches the first of two waterfall turnoffs, turning to explore Cherokee Falls. The enormous waterfall plunges 60 feet from an enormous, curved cliff into a cool, blue pool of tranquil water below. Departing Cherokee Falls, the hike continues the descent, winding deeper into the canyon’s depths and carving through switchbacks on a series of stairs and landings. 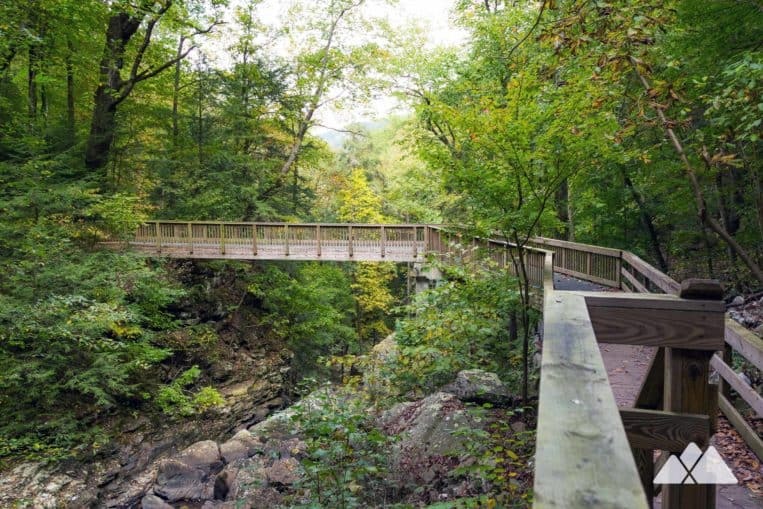 Following a signed side trail to Hemlock Falls, the hike reaches the Hemlock Falls wooden viewing platform and catches distant views of the large, plunging 90-foot waterfall. Departing Hemlock Falls, the hike backtracks to the main trail, and crosses the tall wooden bridge spanning Daniel Creek. This is the official start of the Sitton’s Gulch Trail, and the bridge offers beautiful views of the boulder-littered canyon floor below. The descends a set of stairs to the creek’s western banks, and drops elevation on a steep, graveled slope to a beautiful fern, moss and hemlock-filled forest. Giant boulders covered by green moss and silvery lichen dominate the rocky, angular landscape. Scattered boulders are a reminder that the canyon is ever-changing, as nature continues to sculpt its rocky walls. The fresh scent of hemlock fills the crisp air. Small waterfalls cascade below the bridge, crashing through the relative quiet of the surrounding canyon. The hike dives deeper into the canyon’s depths, exploring the quiet, peaceful, wooded oasis secluded from the buzz of the canyon rim above. The trail hugs the creek’s western shore, following blue blazes through the boulder-strewn valley. The sound of falling water is continuous as the creek tumbles over rock in cascading waterfalls and pools in crystal-clear basins. A towering tree canopy shades the forest, and the air is damp and cool. Several enormous old-growth trees flank the sides of the trail, soaring high into the canopy overhead. The trail begins to level elevation at 2.25 miles. The trail widens, meandering through a young deciduous forest, crossing several seasonally-flowing side creeks and passing the start and end of a permit-only loop trail on the left. The rocky, steep sloped canyon has leveled to a soil-rich forest environment where wildflowers thrive in warmer months. 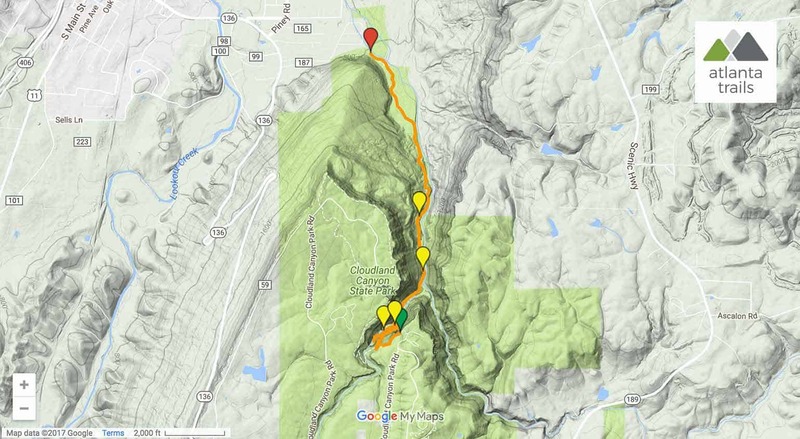 The trail reaches a parking area at just over 2.5 miles, turning to retrace the hike into Cloudland Canyon’s basin. It’s a tough return to the trailhead, climbing over 900 feet to scale the canyon’s eastern wall. Reaching the canyon rim and trailhead at 5.1 miles, the adventure ends. Visiting the park with energy (and daylight) left to spare? Explore the canyon’s view-packed western rim on the West Rim Loop Trail, catching view after outstanding view from a series of rocky overlooks (and a great spot to catch sunrise over the canyon, too). And consider spending the night, if you can: Cloudland’s often-cool climate makes a great spot to camp, and the park’s walk-in campsites are one of our favorite spots to camp in northwest Georgia. 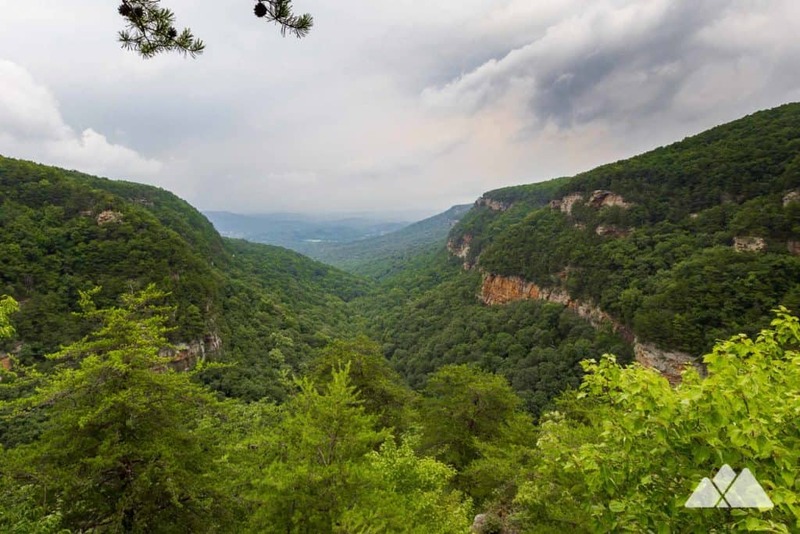 And check out our Cloudland Canyon State Park adventure guide for more ways to play in this fantastic park.